A specification for contractor moisture quality control (QC) in roadway embankment construction has been in use for approximately 10 years in Iowa on 190 projects. The use of this QC specification and the development of the soils certification program for the Iowa Department of Transportation (DOT) originated from Iowa Highway Research Board (IHRB) embankment quality research projects. Since this research, the Iowa DOT has applied compaction with moisture control on most embankment work under pavements. 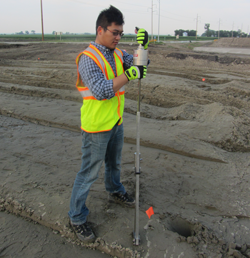 This study set out to independently evaluate the actual quality of compaction using the current specifications. Results show that Proctor tests conducted by Iowa State University (ISU) using representative material obtained from each test section where field testing was conducted had optimum moisture contents and maximum dry densities that are different from what was selected by the Iowa DOT for QC/quality assurance (QA) testing. Comparisons between the measured and selected values showed a standard error of 2.9 pounds per cubic foot for maximum dry density and 2.1 percent for optimum moisture content. The difference in optimum moisture content was as high as 4 percent and maximum dry density was as high as 6.5 pounds per cubic foot. Furthermore, the ISU testing results showed higher rates of data outside of the target limits specified based on the available contractor QC data for cohesive materials. Also, during in situ construction observation, disking was not effectively used to aerate the wet fill materials. Several test points show that materials were placed wet of the target moisture contents. To improve on the current QC/QA field practices, the researchers recommend that alternative specifications be reviewed and developed to incorporate strength- and stiffness-based measurements including intelligent compaction mapping.